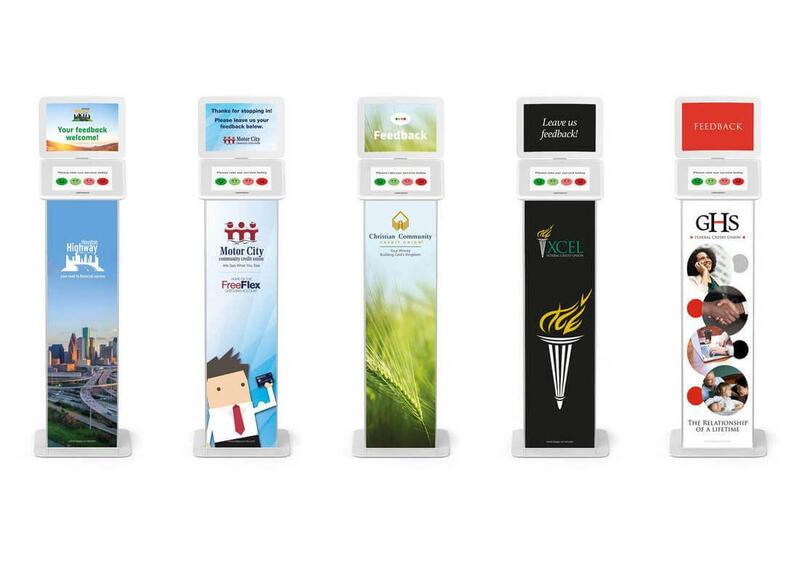 Credit unions across North America are opting for the custom branding option that HappyOrNot is offering with their new Touch terminals, and the results are an array of innovative, colorful displays for branch visitors to enjoy. Andover, MA — The new 3-tier, tablet-based Touch model also provides comprehensive member feedback capabilities. After responding to the initial question on the screen, members can choose from a list of categories selected by the credit union (i.e. Wait times, Employee professionalism, Loan rates, etc.) and then enter detailed comments. “The new capabilities provided by the new Touch model enable us to obtain near-real time detailed feedback from our members” says Howard Meller, CEO of GHS Federal Credit Union headquartered in Binghamton, NY. “The colorful branding helps us promote our messaging and attracts our members to use the terminals.” GHS FCU had previously used the standard HappyOrNot terminal for 3 years prior to recently upgrading to the new Touch model. With the Touch model member feedback is available to credit union execs and branch managers via the HappyOrNot Reporting Portal within minutes of being entered. The terminals are polled every 10 minutes via a cellular cloud service and the results are immediately reported. “Nearly all credit unions and banks across North America that have purchased the HappyOrNot Touch terminals have chosen the custom branding option” says Ed Gundrum, CEO of DoublePort, LLC, an authorized partner and reseller of HappyOrNot. “It’s a very inexpensive way of adding artwork and messaging to every branch office”. HappyOrNot® is the global leader in instant customer and employee satisfaction reporting. Our innovative feedback collecting smileys and intelligent data analytics reporting service help our clients to improve their customer experience, relationships, and employee engagement. We serve nearly 4,000 companies across 120 countries and have collected and reported on over a half billion feedbacks. For more information, visit happy-or-not.com. DoublePort LLC is a global business development, reseller of HappyOrNot products. . The company focuses upon the financial sector (banks and credit unions) for HappyOrNot. For more information, please visit doubleport.com or email sales@doubleport.com..